I went home for my niece's birthday this last weekend and my dad agreed to let me take away his mother's Newton's cradle. Remember these? 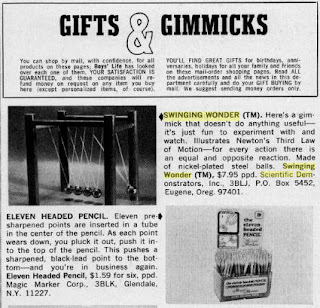 It still has part of the "Scientific Demonstrators, Inc" sticker on it and apparently it was marketed as the Swinging Wonder. According to the Eugene Weekly, this model was created by Lee Trippett for an assignment at the University of Oregon, where he was earning his certificate to teach physics. There's a section on him hunting Bigfoot (really) and a line that asks, "Are you the man with the swinging balls?" It's worth a read. Boys' Life (March 1969) declared that "it doesn't anything useful." It may not do anything useful, but I love it. Growing up we saw my grandma on my father's side pretty infrequently. The thing I remember most about visiting her house in southern California is this contraption. I loved playing with it, even if I didn't understand that it was demonstrating Newton's Third Law of Motion. I also have her sewing box, which still has her patterns for nightgowns that require four yards of fabric. Oddly, there are no instructions for adding words to the backside. Now I just need to figure out how to polish the steel balls. Anybody know? You might want to ask an antique dealer if you should polish the steel balls. Sometimes you remove patina that adds to the overall value.